Our friend and winemaker from the Amalfi Coast, Luigi Reale, introduced us to Valentino Esposito and Mario Anastasio, who make our liqueurs under the label ‘Il Gusto di Amalfi.’ Their small facility, which looks like a large kitchen, is in the little town of Praiano, just down the coast from Positano. This area is famous for growing amazing citrus, especially lemons; these lemons are grown by Mario and his family and friends. Most fine wines and spirits are great because of the way they balance different components, but limoncello is different. Limoncello is a pure infusion of lemon peel, and the quality of the limoncello depends on the quality of the lemons. 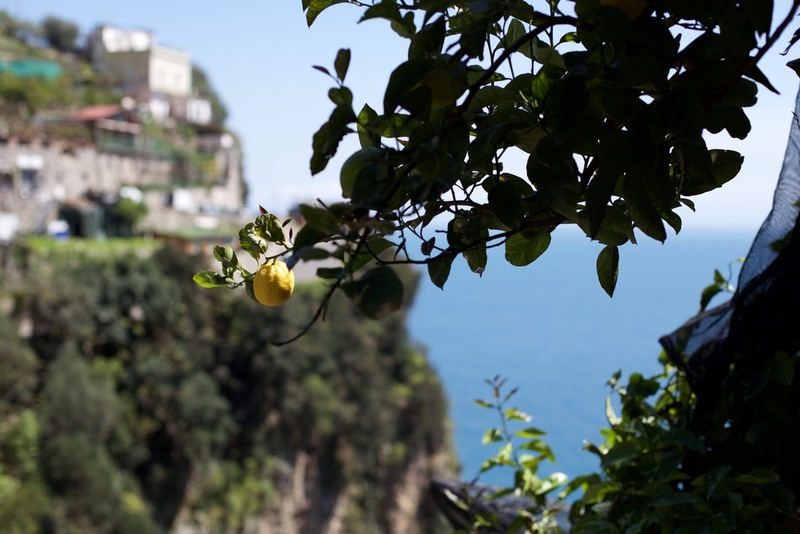 ‘Il Gusto di Amalfi’ is a tiny company that takes organically-grown lemons from the hillsides of the Amalfi Coast (near Tramonti), peels them by hand with potato-peelers in small batches, and macerates them in pure grain alcohol in stainless steel vessels like very small wine tanks. (Commercial limoncello is sometimes bitter, a sign that the pith of the fruit has been accidentally included with the zest; hand-peeling avoids this.) The variety of lemon is ‘Sfusato Amalfitano’, and the groves are owned and farmed by Mario Anastasio’s friends and family. This limoncello is pure expression of an excellent raw material, and that’s it. Drink cold but not iced as a digestivo; the liqueur may need to be shaken occasionally to mix in the lemon oils that rise to the top. I bet this would also make a killer Tom Collins with some good Gin. Mandarin oranges of the ‘Marzatico’ variety, grown organically on the hillsides of the Amalfi coast, picked in season between January and April, peeled by hand, the peel immediately macerated in pure grain alcohol for 3-4 days. This is the purest expression of perfect mandarin oranges; the citrus here in the south of Italy is amazing, very different from what we see generally here in the US, and the quality of the fruit is the whole story with this kind of liqueur. Great digestivo; drink cold, but not iced. The liqueur may need to be shaken occasionally to mix in the lemon oils that rise to the top. Try a dash of it with good Prosecco, too. Wild fennel grows profusely on the Amalfi coast, as it does in California. The seeds from the tall plants are harvested by hand in October when the seed-heads are dry, dried, sifted, macerated in pure alcohol for about 40 days, then blended with sugar and bottled. Great digestivo (substances found in fennel-seed are said to be good for the digestion) and craft cocktail ingredient. Drink cold but not iced.